Update on Sunny – A Reason to Believe Animal Rescue, Inc.
We’ve had so much going on, I forgot to post an update on Sunny. Sunny is in rough, rough shape. She is very infested with hook and whip worms. She has a strange circular opaque thing in her stomach which could explain why she threw up twice. She is OLD and there is no way to tell how old. Best we can say is 10+ years. She is hospitalized. Overall her blood work was not bad but she did have an elevated white count and minor dehydration so she has started antibiotics. She has chronic luxating patellas and with the level of arthritis, it’s bad. Her entire body is racked with arthritis. 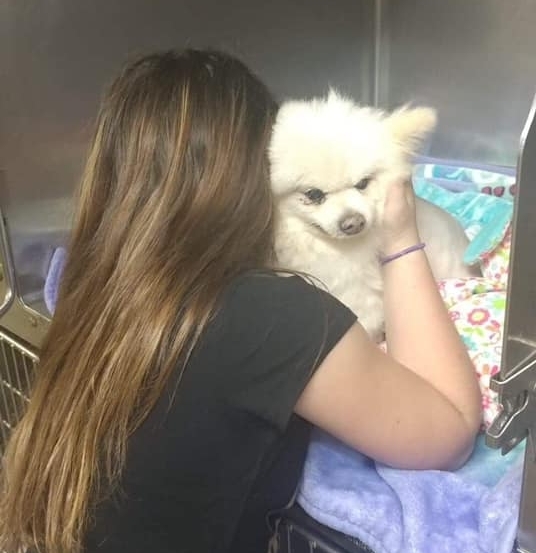 Roby said it is so bad that she felt terrible for manipulating her for x-rays but not once did she offer to bite. She also has ear mites. There is a surgery for the patellas but Doc said he advises against it because due to her age, the level of arthritis and tendon damage, he would not consider her a candidate for a successful surgery. She will stay hospitalized for now and get fluids and antibiotics. She has had Drontal and is being treated for the mites. We will remove the mammary tumors and do the spay this week once she is hydrated. The good news is no spreading of the mammary tumors. 4dx was negative, which means no heart worms or tick-borne diseases. She has no teeth, so won’t be needing a dental. Her tongue hangs out of her mouth because there’s no teeth to keep it in place. Thank you to the ladies at Wags to Riches for taking Sunny in off the street after she was thrown out of a vehicle and contacting us so quickly to get her into rescue so she could get the medical care she needed. Her foster, Julia Sharp from TLC Rescue, will be going to see her today and I’ll post an update. Julia says she’s very sweet. It takes a village to help all these neglected dogs and we very much appreciate cooperative collaboration with other rescues. Thank you so much, Julia, for stepping up to foster her on such short notice even though you’re in such a stressful situation right now. It is truly appreciated. We know she will get the best of care in your hands and look forward to meeting Sunny in person when she’s well enough to be released from your vet and transported to us. We haven’t paid her vet bill yet. Julia told us to just call in the payment to her vet when the vetting is complete. Sunny is one of three expensive medical case dogs we have in our care at the moment. Please consider donating. Previous Post Yelp for help! Mazel needs surgery!